Every now and again you go in blindly seeing a show. Let the wind take you were it may. Before seeing Coffee and Biscuit I knew nothing about it besides there being puppets. As the play progressed and I figured out just exactly what I was watching, I had a newfound love for this piece. Coffee and Biscuit is a genius new telling of the Ibsen classic A Doll's House. Set in the 1950s against a backdrop of Hoovers and Jell-O, Coffee and Biscuit follows Nora Helmer on a journey through feminism and gender roles in a media-influenced society. Oh, and there are puppets. Coffee and Buscuit is a wildly innovative and spectacular exploration of Henrik Ibsen’s A Doll’s House through a thought-provoking lens and era. Written by Teresa Ann Virginia Bayer, Coffee and Biscuit turns the classic right on its head, analyzing the specific theme of women and presenting a gallant view. The characters from the source material have gotten a lovely update playing an integral part in Nora’s journey. 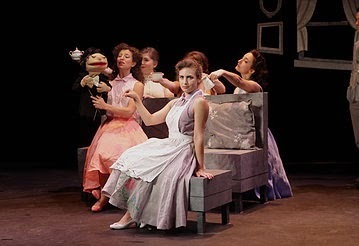 The men of Nora’s world are played by puppets operated by women. The only man on stage is a well dressed man who serves as Nora’s puppet master. What Bayer does well is gives a fresh approach to an overdone story. By having an ensemble of strong women operate the male characters, the commentary of gender roles is even more present and stimulating. Zoe Farmingdale gives a tour de force performance, leading the pack as Nora. Farmingdale brings an airy, innocent quality to the housewife. Bethany Nicole Taylor brings great character work to Betty, Nora’s best friend. Her balance between actress and puppeteer is seamless and unrecognizable. Mike Racioppa as the Man personifies the puppet master idea quite well. He’s presence is subtle yet impactful. Rounding out the ensemble were Melissa Diane Martin as Harold the husband, Cindy Kay as Carl the loaner, and Alexandra Gellner as Dr. Smith. They each brought variety as puppeteer and television ad. Regardless of where you lean toward the moral of this piece, the approach by the entire team takes is remarkable. The manic world that Nora lives in is defined by a greyscale set designed stunningly by Douglas Clarke. Despite not having a working television for the performance, the production was near flawless. The costume design by Alexandra Rozansky was stunning, placing Nora in her grey world and the rest of the ladies in matching outfits of color. Christina Watanabe’s lights added an extra boost of color. Watanabe went above and beyond giving the ladies’ television moments the right feel. The only dramaturgical question that Coffee and Biscuit was whether the original music by Jay Spriggs correct. The music Spriggs brought was beautiful and worked well for the mood of the play but it was the only element of the show that was not in the same period. The true stars of the show were the puppets. Designed by PuppetFluff and Bayer, each character truly had it’s own unique identity. Teresa Ann Virginia Bayer devised a world that worked wonders as an individual play as well as paying great respect to the source material. What Coffee and Biscuit does well is it opens up a conversation about the source material as well as the themes it presents. By having a clever device with the puppets, the theme is subtler.